In the story Ant Storm, Max, Cat, Ant and Tiger are evicted from their micro-den by an army of ants. The children set out to find out what has happened to the ants' nest. But when they get there, they make a shocking discovery...they find an X-bot factory and some fearsome ant-bots! Find out if the children can escape the ant-bots and shut down the factory in Ant Attack. In Round-up, read about what happens to Max and his friends when they come up against some bullies who are threatening a swan and her cygnets. Find out about historical conflicts in the non-fiction book Charge!. 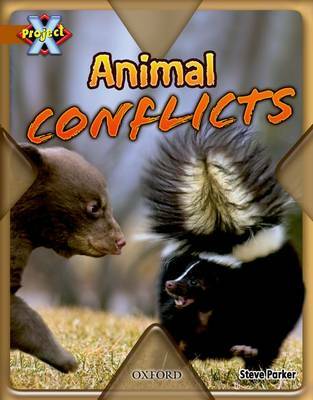 Then read about the fight for survival in the natural world, in Animal Conflicts. Each book comes with notes for parents that highlight ambitious words or concepts in the books, prompt questions and suggest a range of follow-up activities. The Conflict Guided Reading Notes provide step-by-step guided reading support for each book in the Conflict cluster, together with guidance about comprehension, assessment for learning and vocabulary enrichment. Hands-on follow-up activities, plenty of writing opportunities and cross-curricular links are also provided for each book.